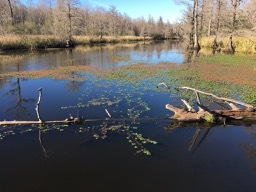 The Alligator Loop trail at Old Santee Canal Park is a 1/2 mile loop that you access either via the Osprey Loop trail or from the gravel service road near the Childrens Garden. It gives a nice mixture of dirt trails and boardwalks with multiple observation points along the way. All-terrain strollers can navigate this trail though some sections have lots of roots and the boardwalks can be slick if there was a recent rain. 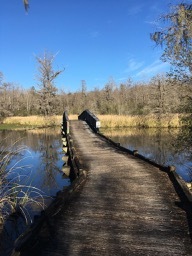 A child carrier or hiking harness/backpack leash can be good for young walkers with much of this trail being near water or crossing open boardwalks over water. This is a good length for new walkers though little legs will likely tire before finishing. 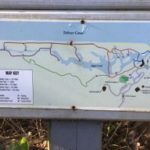 Multiple shelters and benches along the trail make good resting spots and turtles and birds are often spotted from this trail. 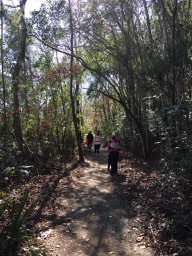 This is a great choice for a family with young children who may not be up to one of the longer hikes at Old Santee Canal Park. 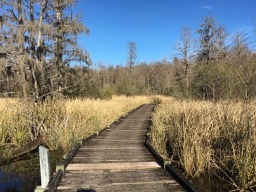 When combined the portion of the Osprey loop needed to reach the Alligator Loop, the total distance is just under 1 mile. Though Fall, Winter and Spring may be the most pleasant, this trail can be done in the summer months as well.